As the field of immunology blossomed, in the 1920s and 1930s researchers found that tumors express antigens that are also found on embryonic tissues (an antigen is a molecule that the immune system recognizes, usually a protein on the cell’s surface). Specifically, it was found that antibodies made against tumors in the digestive track reacted with the tumors as well as tissues from embryonic and fetal gut and pancreas (Hirzfeld, 1929; Hirzfeld et al., 1932). Later in the early 1970s, several studies reported that antibodies developed against a variety of animal tumors reacted against embryos (as well as the original tumor)(Brewer et al., 2009). While it was becoming clear that antibodies made against tumors could recognize embryonic tissues, researchers wondered whether the reverse was true: Could antibodies made against embryonic tissues react against tumors? In the 1960s, it was found that about 80% of blood sera (which normally contains antibodies) from pregnant women in the first two trimesters contained antibodies that reacted with tumors (as well as embryonic tissue) (Alexdander and Fairley, 1967). These and following studies led to the idea of universal “oncofetal antigens,” antigens that are expressed by tumors and fetal/embryonic tissues. As the concept of oncofetal antigens developed, researchers explored a hypothesis with very practical applications: Because pregnant animals develop antibodies that can recognize tumor tissues, pregnancy may “immunize” an animal against cancer. Some early observations that supported this theory were nearly 300 years old, when celibate nuns were thought to have increased incidences of breast, uterine, and ovarian cancer (Brewer et al., 2009). While some hypothesized that this was due to a lack of “hormonal stimulation” (as has been suspected to be a factor in breast cancer), others thought it might be due to a lack of antibodies generated against embryonic tissues. Further evidence to support the latter explanation was published in the 1960s to 1980s, as multiple studies reported that women and animals that were multiparous (pregnant multiple times) not only had less spontaneous cancers, but multiparous animals also had fewer carcinogen-induced cancers and were somewhat resistant to transplanted tumors (Brewer et al., 2009). In the early 1970s, researchers further dissected this immune response and found that pregnant women produced cytotoxic T lymphocytes that could kill tumor cells but not normal, benign cells (Ambrose et al., 1971). While researchers were finding that pregnant animals have some immunity against cancer, researchers started testing whether injecting, or “immunization,” with embryonic tissues alone could similarly trigger an immune response and/or confer cancer immunity. In the late 1960s and early 1970s, many reports were published supporting this theory; anti-tumor antibodies were repeatedly found to be stimulated, and tumors sometimes even prevented, after vaccination with early embryonic tissues or cells (but not adult tissues or cells), even when tested across different species, revealing the presence of conserved antigens (Brewer et al., 2009). In 1970, researchers found that rabbits immunized with homogenized 9-day-old mouse embryos created antibodies that cross-reacted with 72 different mouse tumors from 12 different tissues of origin (created “spontaneously” or induced by viruses or chemicals). The antibodies, as expected, also reacted against embryonic tissues, and, strangely, adult skin (but no other adult tissues) (1970, Stonehill and Bendich). Human embryos also conferred an immune response; again, antibodies produced against the embryos recognized many different types of human tumors and showed no cross-reactivity with adult tissues except skin (Klavins et al., 1971). Immunization with embryonic cells (instead of homogenized embryos) had similar results; immunized mice made antibodies that recognized tumors, embryos, and, again, adult skin (Bendich et al., 1973). These immunized mice were also fairly resistant to tumor induction. Overall, these studies of the late 1960s and early 1970s strongly suggest that vaccination with embryonic tissues not only triggers an immune response against cancer, but may also prevent it to some degree. But in order to truly harness the potential of using embryonic tissues/cells/proteins to immunize against cancer, the problem of immune tolerance must be better understood. In both patients with cancer and women who are pregnant, immune tolerance takes place in an apparently similar, transient manner. In the 1960s, a study reported that while patients with sarcomas usually did not have detectable antibodies against the tumor, after the tumor was surgically removed, anti-tumor antibodies increased, while this was not seen in patients whose sarcomas were not successfully removed (Ambrose et al., 1971b; Morton et al., 1970). Similarly, antibodies against oncofetal antigens are present in pregnant women in the first two trimesters (presumably while the embryo is seen as “non-self”), then disappear, then reappear after birth (Gold, 1967). (Younger embryos in mice have also been found to be most effective at conferring tumor immunity.) The cause for the transient immune tolerance in both cases is unclear, although “blocking factors” in serum were identified in the early 1970s. The factors most likely (1) prevent recognition of the embryo/cancer (are protective antibodies or antibody/antigen complexes) and/or (2) are immunosuppressive cytokines, e.g. TGF-beta (Brewer et al., 2009). Clearly, to better understand immune tolerance in cancer, it is necessary to better understand it during pregnancy. There are most likely many reasons in common for why pregnancy and tumors are not rejected more often than they are. While these studies showed many promising findings for fighting cancer, published reports significantly decreased after the mid-1970s, possibly due to decreased funding and infeasibility of progressing the studies further for obvious reasons (Brewer et al., 2009). However, the connection between cancer and embryonic tissues/cells has been revisited recently with the development of human embryonic stem cells. While it is still largely under debate, much evidence suggests that cancer arises from cancer stem cells. Cancer stem cells share many similarities with human embryonic stem cells (hESCs) (which are stem cells isolated from the inner cell mass of a blastocyst) and induced pluripotent stem cells (iPSCs) (which are adult cells that have been reprogrammed to be hESC-like). These similarities were explored in a previous All Things Stem Cell article: “Better Understanding Cancer and Induced Pluripotent Stem Cells Through Their Similarities.” The basic similarities between iPSCs/hESCs and cancer stem cells are that they can all (1) be potentially pluripotent (or at least multipotent, having an increased potency), (2) avoid apoptosis/cell death (they are proliferative), and (3) express similar cell markers (such as some oncofetal antigens). hESCs and iPSCs can also, due to these traits, create teratoma tumors (a tumor with cells from all three germ layers) when injected into animals. Recently, a report by professors Yi Li, Zihai Li, and colleagues (at the University of Connecticut School of Medicine) expanded upon the previous embryonic immunization studies by using an established embryonic stem cell line for the first time. This re-visitation was most likely prompted by recent interest in the promising, growing fields of cancer vaccines and embryonic stem cells. Many cancer vaccines target oncofetal antigens, which are present on hESCs and iPSCs as well, lending support to the idea of using hESCs and iPSCs to stimulate an immune response against multiple antigens on a tumor. With this recent report by Li et al. bringing attention back to the long-standing field of cancer vaccination using embryonic tissues and cells, other groups may also revisit this potentially promising tool for fighting cancer. Alexander, P., and Fairley, G. H. Cellular resistance to tumors. Br. Med. Bull. 1967. 23:86–92. Ambrose, K. R., Anderson, N. G., and Coggin, J. H. Cytostatic antibody and SV40 tumour immunity in hamsters. Nature. 1971a. 233:321–324. Ambrose, K. R., Anderson, N. G., and Coggin, J. H. Interruption of SV40 oncogenesis with human foetal antigen. Nature. 1971b. 233:194–195. Bendich, A., Borenfreund, E., and Stonehill, E. H. Protection of adult mice against tumor challenge by immunization with irradiated adult skin or embryo cells. J. Immunol. 1973. 111:284–285. Brewer, B. G., Mitchell, R. A., Harandi, A., Eaton, J. W. Embryonic Vaccines Against Cancer: An Early History. Exp. Molec. Path. 2009. 86:192-197. Buttle, G. A. H., Eperon, J., and Menzies, D. N. Induced tumour resistance in rats. Lancet. 1964. 2:12–14. Gold, P. Circulating antibodies against carcinoembryonic antigens of the human digestive system. Cancer. 1967. 20:1663–1668. Hirzfeld, L. Untersuchungen über die serologischen Eigenschaften der Gewebe: über serologische Eigenschaften der Neubildungen. Z. Immun.Forsch. Exp. Ther. 1929. 64:81–113. Hirzfeld, L., Halber, U., and Rosenblat, J. C. Verwandtschaftsreaktionen zwischen Embryonal- und Krebsgewebe; Mesenchenembryo und Menschenkrebs. Z. Immunitatsforsch. Exp. Ther. 1932. 75: 209–216. Li, Y., Zeng, H., Xu, R., Liu, B., Li, Z. Vaccination with Human Pluripotent Stem Cells Generates a Broad Spectrum of Immunological and Clinical Responses Against Colon Cancer. Stem Cells. 2009. 27:3103-3111. Morton, D. L., Eilber, F. R., Joseph, W. L., Wood, W. C., Trahan, E., and Ketcham, A. S. Immunological factors in human sarcomas and melanomas. Ann. Surg. 1970. 172:740–749. Muller, J. Ueber den feineren Bau und die Formen der Krankhaften Geschwulste. Reimer, Berlin (1938). Parmiani, G., and Della Porta, G. Effects of antitumour immunity on pregnancy in the mouse. Nat. New Biol. 1973. 241:26–28. Stonehill, E. H. and Bendich, A. Retrogenetic expression: the reappearance of embryonal antigens on cancer cells. Nature. 1970. 228:370–372. Zwaka, T. P. Stem Cell Vaccination Against Cancer: Fighting Fire With Fire? Molec. Ther. 2010. 18.1:8-9. 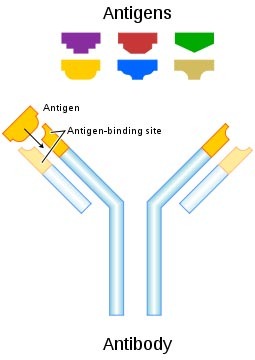 Image of “Antibody and Antigens” was taken from Wikipedia and redistributed freely as it is in the public domain. admin	Cancer Stem Cells, Embryonic Stem Cells, Induced Pluripotent Stem Cells	cancer, embryonic, history, news	© 2009-2010, Teisha Rowland. All rights reserved.